Zion is a city located in Lake County, Illinois. As of the 2010 census, the city had a total population of 24,413. The total area of the village is 8.2 square miles. The city was founded in July of 1901 by Dr. John Alexander Dowie. He also started the Zion Tabernacle of the Christian Catholic Apostolic Church, which was the only church in town. It was built in the early 1900s and burned down in 1937. 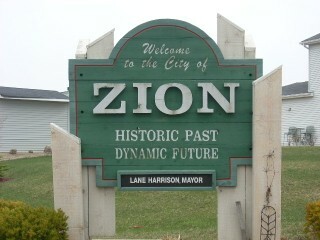 Zion is his dream of a city endowed with a biblical sense and purpose. Most of the street names in Zion can be found in the pages of the Bible. Shiloh House is the 25-room mansion built by John Alexander Dowie. Now owned by the Zion Historical Society, the mansion is open for public tours on weekends. Zion is the home of the Illinois Beach State Park: South Beach. The North Beach is in Winthrop Harbor, IL. In 1950, the Illinois Dunes Preservation Society was established to maintain the natural qualities of the beach. With the help of the Illinois Department of Conservation the area south of Beach Road were established as the state's first natural preserve. Citywide Services provides residential appraisal service in Zion, Illinois 60099. Appraisals for divorce settlements, prenuptial agreements, estate settlement, bankruptcy, property tax appeals, bail bonds and for sale by owner. Our appraisers are state certified and have experience with single family homes, town houses, condominiums as well as small residential income properties. When you need to find a real estate appraiser in Lake County contact Citywide.